This particular necklace has a smaller counterpart in the catalog, with a smaller cross and a shorter chain. However, if you're looking for something that has a bit more presence to it, then this is the choice you should make. It has the same stainless steel make, along with a cross as the centerpiece and blue carbon fiber added to the center of the cross to give it that color that many cross necklaces don't have. The cross is bigger on this model, and it has a longer chain, at 22 inches. The added size adds that little bit more to it, making it stand out a little more for those that want to make more of a statement. 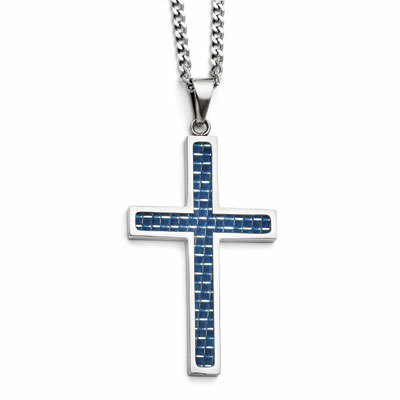 Our large stainless steel blue and carbon fiber cross is truly a statement piece. Cross measures 50mm (1 15/16") x 31mm (1 1/4") and comes with a 22 inch 3mm stainless steel curb chain. We guarantee our Blue Carbon Fiber Cross Necklace in Stainless Steel to be high quality, authentic jewelry, as described above.